The early history the Methodists and this chapel is covered by the article on the Wesleyan Chapel. Major internal refurbishments in 2009. The Church on Roe Lane was affected by mining subsidence in the 1960s and had to be extensively repaired, losing its handsome semi-gothic frontage. In 1962 the Primitive Methodist congregation sold their separate building (The West End Chapel), which was then converted in to the present Woodborough Garage. The Primitives then merged with the Wesleyans in Roe Lane. 1966. During the year, modernisation of the Chapel, (now known as a Church), included valuable gifts. 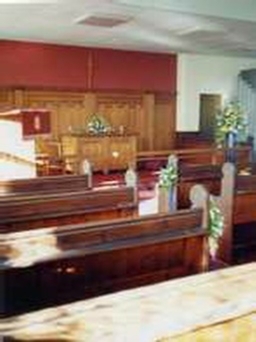 Mr J Richardson, a local preacher, donated an oak screen and communion table, which were transferred from the Wilford Hill Crematorium Chapel. The screen formed a background to the new communion area. A new floor of oak boards contained by a new altar rail was fitted. The new pulpit, designed to blend with the screen, was positioned to the side. A new internal doorway was made alongside the organ, to enable easier movement of people between the Church and Schoolroom, without the need to pass over the raised area. The cost of this scheme was about £560. 1969. In January cracks were appearing in the west and centre walls of the Church due to coal mining subsidence. During July of the same year, the northwest corner wall became unsafe and was rebuilt by the National Coal Board. Further repairs would prove to be necessary, but it was essential that a period of time should elapse, to allow for the building structure to settle. 1970. A gift of a light oak cross was gratefully accepted and suspended in the Communion area. Also during this year a water toilet was installed and connected to the main drain. 1976. In June following much discussion, the National Coal Board [NCB] commenced work on the building repairs. Whilst this was done Sunday Services were held in the Scout Hall on Lingwood Lane. The NCB repairs were to include a suspended ceiling and repainting of the Church both inside and out. 1986. The exterior of the property was repainted. 1987. A new organ was installed, dedicated to Mr Edwin Spencer, a generous benefactor, who died in 1984. 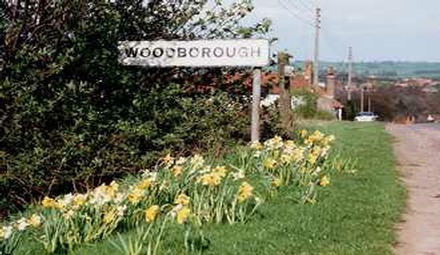 The Church Centenary was also in 1987 and celebrations began in the autumn of the previous year by the planting of daffodil bulbs at the ‘Woodborough’ signs on the five approach lanes into the village. They were planted by members of the Church and their relatives with a £50 donation given by the Gedling Borough Council to enable the purchase of the bulbs. Ten new altar kneelers were designed and worked by church members and friends using our Lord's sayings as inspiration "I am the vine" and "I am the door" etc,....(canvas and wool costing £104). April 10th 1987 saw the official beginning of the Centenary celebrations. A service opened our first ever Flower Festival, a marvellous weekend bringing in hundreds of visitors including visitors from around the 'Circuit' oflocal Methodist Churches. An exhibition of historical photographs was held in the Institute on Roe Lane. On October 24th The Carlton Male Voice Choir gave a memorable concert in the Village Hall, and this concluded the celebrations of a truly wonderful year. 1988. In this year the Sunday school regrettably closed due to a lack of new members, and compounded by the departure of the teachers. 1989. The National Coal Board agreed to repaint the outside of the Church excluding the front. New oak gateposts set in metal sockets replaced the old front entrance ones and new metal gates and posts fitted to the side entrance at a cost of £345. 1990. 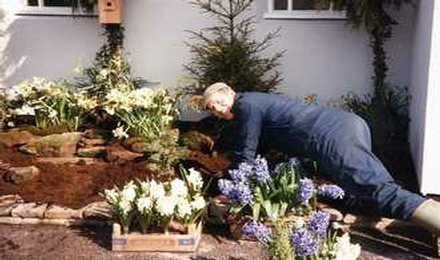 A raised garden bed was built outside the front entrance doors, planted with bulbs and shrubs. A new light oak handcrafted chair that matched the existing altar was bought; Mrs Brenda Sadler gave these in dedication to the memory of her husband Mr John Sadler who died in 1987. 1992. The Schoolroom floor was replaced at this time with four and half tonnes of rubbish removed from underneath the old floor. A previous chemical treatment for damp proofing the walls had proved unsatisfactory; to reduce the risk of further deterioration of the flooring timbers it was decided to place additional air bricks in to the walls to increase the airflow. 1993. A joint Sunday school with St Swithun’s Church was formed and met in the Methodist Schoolroom; this continued until the year 2000 when the combined Sunday school moved to the new extension at St Swithun’s Church on Lingwood Lane. 1997. 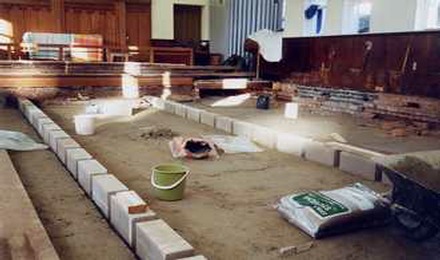 Further restoration work was needed to the floor of the Church because the flooring had become unsafe. At least ten tonnes of rubbish was removed from below the floor timbers, poor ventilation combined with rubbish that had been standing on wet soil causing the problem. 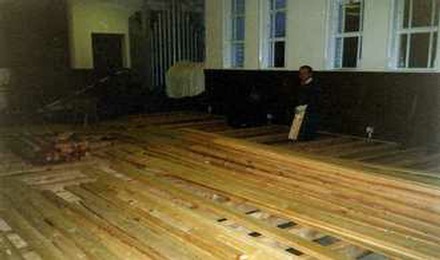 At this time the Church timbers were treated for woodworm, a new electric heating system was installed and after replacement of the floor a new carpet laid. Church members and friends of the Church worked very hard at fund raising to replace the money drawn from the Bank account. Above left: The old rotten flooring has been removed and new supports for the joists put in place. Above right: The new timber floor being laid. 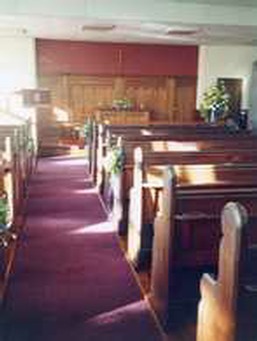 Left & right: The pews have been reinstated and the new carpet laid. All photos dated 1997. 1998. To assist the hard of hearing, a loop audio system was fitted to improve the quality of listening for those with hearing aids. The exterior of the Church was repainted together with interior painting of the lobby and kitchen. 2000. A new notice board was fixed to the front wall of the Church, by the main doors, in memory of Mr Sam Middup who died in 1999. Woodborough Methodist Church year 2000. The Methodist Witness in Woodborough spans a period of around 175 years. Unfortunately, the records of the former Wesleyan Society have been lost. The Wesleyans were direct descendents of the 18th Century Evangelical Revival that led to the Methodist Church ceding from the Anglican Church following John Wesley’s death. Their Church, known as The Central Methodist Church, was built on its present site (Roe Hill/Main Street corner) in 1877. There are still descendents of the original trustees alive in the Village today, among them Alan Wright. The strong emphasis on scriptural Holiness with the call to a changed heart matched by Social Concern was well-captured in the life of the late Sir Frank Small. The earlier divisions in Methodism are reflected in the visit of William Clowes to Woodborough in 1817. Clowes was pelted with eggs and St Swithun’s bells rung to drown his message. It was however a visit of the Rev.d William Morton, from Arnold, that led to the formation of a Primitive Methodist class in Woodborough. They met in William Bradley’s cottage, before moving into the Barn. In 1851 the Chapel opened, on the site of the Garage. The stalwarts were Joseph Marriott, James Leafe, James May and William Orange. Further extensions were made in 1900. This Church closed in 1962, among its last leaders was Evelyn Foster. From 1962 onward the Methodists have worshipped in the former “central” building. In 1967 following subsidence, the Chapel was refurbished to its present state . The Methodist people have left their mark on Woodborough. The decline of the large families led to an ebb in the numbers, but for all that has been achieved spiritually, socially and community service, we thank God, as we look forward we do so in trust that we may “serve the present age our calling to fulfil”. A way that includes services with and alongside members of the whole Christian Presence in Woodborough. First published in the Woodborough Newsletter. Ministers: Ministers to the Woodborough Methodists have included the Revs; J Alex Heyes, Bill Davies, Philip Tordoff, Paul Regan, Peter Ormerod, then Derek Maylor in 1969, Bob Ormisher 1976, David Bryon 1980, Christopher Edwards 1989, and Peter Bates from 1996 to 2002. The newly appointed minister, Rev’d Alec Siatwinda, first preached in Woodborough on Sunday 1st September 2002.
at his first service in Woodborough on 1st September 2002. Sunday worship is supplemented by a devout and dedicated group of local preachers, to whom our Society owes a great deal. Each year they also fund raise for Home & Overseas Missions; National ’Children's Homes - 'Action for Children', which is their own national Methodist Charity. Membership: The average membership of the Woodborough Methodist Church during the 1980's was around 37; during the 1990's this fell to an average of 32. Actual membership in the year 2000 has now fallen to 28 with church attendance around 12. Membership of the Church is predominantly from the older members of the community who through ill health or infirmity find it difficult to attend services.